Today’s seniors (the 65 and over population) continue to maintain an active lifestyle and they are being diagnosed with multiple orthopedic injuries and movement dysfunctions. Many seniors are requiring a sports medicine approach to rehabilitation so they can effectively return to their activities. Are we delivering a safe pathway for them to reach their functional goals? The purpose of this two day intermediate level course is to develop efficient and effective rehabilitation programs for common lower extremity geriatric dysfunction utilizing the best available evidence in conjunction with sound application of kinetic chain movement analysis. This will allow the participant to problem solve both simple and complex movement dysfunction and design and progress conservative and post-operative rehabilitation programs. Regardless of rehabilitation setting, pelvis, hip and knee fractures, joint replacements and osteoarthritis are now making up a significant portion of a therapist’s case load. Some significant questions can arise such as: What factors determine the choice of orthopedic procedures, prosthetic design, and fixation choices? Why do some patients receive a total hip replacement following a hip fracture while others receive various open reduction internal fixation (ORIF) surgeries? Why does weight bearing status of the patients differ? Answers to questions like these will be provided. An extensive look at underlying pathology, specific diagnoses including intracapsular versus extracapsular femoral neck fractures will be investigated. Post-surgical complications, solutions and outcomes will also be presented. The physiology and principles of orthopedic healing will be studied and applied for rehabilitation program design. A hands-on manual therapy approach utilizing joint mobilization, neuro-muscular facilitation and movement re-education will be covered and practiced in labs. Specific focus will be on how to integrate the core when facilitating lower extremity function. Motor control, specific movement analysis of gait mechanics, bridge mechanics, and squatting will also be thoroughly covered and corrected. This intermediate level course combines lecture and extensive lab time designed for participants to practice motor skills covered in lecture that will immediately enhance a clinician’s ability to treat this population. Therapists and trainers working in acute care, in patient and outpatient settings, rehab facilities in addition to sport medicine centers will benefit form the material presented. Recognize the latest surgical advances in joint replacement surgery, total versus partial or hemi- replacement, joint resurfacing, tissue sparring, minimally invasive technique. Describe the relevant anatomy and biomechanics of the kinetic chain for the pelvis, hip and knee. Identify how the underlying pathology dictates choice of orthopedic procedure, joint replacement prosthetic design and fixation choices, rehabilitation program design, and typical functional outcomes achieved. Identify and utilize orthopedic healing principles and radiographic evidence as it relates to post-operative rehabilitation. Describe common orthopedic hardware used in open reduction internal fixation surgery and weight bearing implications. Discuss the latest evidence on the use of CPM and NMES. Develop and prescribe effective rehabilitation programs utilizing functional exercises that consider proprioceptive input, reflexive stabilization, and tendon healing timelines the latest orthopedic surgeries. 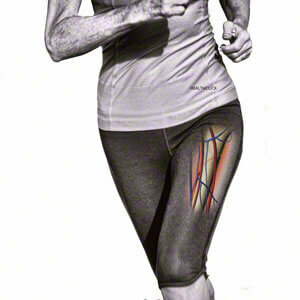 Perform basic joint mobilization of the hip and knee following standard principles. Perform a kinetic chain assessment and incorporate findings into therapy prescriptions including corrective exercises and manual activities.